Inverter Generators Vs Generator - Which is the Best? Your generator can help you power all sorts of appliances and devices when grid electricity isn’t an option. I’ve been through a few generators in my time, and I can tell you, having the right one ready to go when you need it is a huge relief. Whether you’re going to be staying off the grid, preparing for the unknown, or just want to have the whole backup electricity thing solved, choosing the right generator for your specific circumstances is a must. The tough thing about being prepared for an unexpected emergency is figuring out exactly what you’ll need. After all, if you don’t know what you’re going to be facing, it’s hard to be sure which tools you’ll want to have on hand. That’s why I am going to go over some of your generator options so that you’ll be able to get a better idea of what units may work for your individual needs. Inverter Generators Vs Generator due to the similarity in usage, most people interchange these terms a lot, and there seems to be confusion among consumers on the differences between a inverter generators and conventional generator. And after knowing the differences, which one is better between the two? We will try to provide the most detailed answers to all these questions, so read on! Inverter generator or standard generator: Which is best for you? There are quite a few generators out there for you to choose from. You can decide between gasoline, propane, or combination dual-fuel generators. What fuel source will you have the easiest access to? Generators also come with various engine types and power output ratings. Are you only planning to power a few devices for the night or will you need a daily power source that you can trust for months at a time? You can also choose between standard generators or inverter variants. Both have their uses and can be valuable assets when you need electricity on the fly. Conventional generators have been around for quite some time, and the core principles used to make them have always been the same. They are made up of an energy source, which is usually a fossil fuel such as propane, diesel or gasoline. This energy source is used to power a motor that’s attached to an alternator to produce electricity. The engine needs a constant speed of about 3000 rpm to produce a standard current that’s used by most households. Just about every generator runs off either gas, propane, or both. You’ll definitely want to choose a generator that you’ll have an easy time keeping fueled. Gas generators are super efficient, easy for most people to use, and reliable. Gas motors aren’t complicated either so if your gas generator breaks, you will probably be able to figure out what’s wrong with it pretty quickly. On the downside, gas can be hard to store without a fuel stabilizer. Also, if the power is out citywide, you can’t just go get some gas from a gas station. Gas pumps require electricity to work. Finally, gas is a bit corrosive and can leave all kinds of residue behind. Gas generators will require regular cleaning. You’ll want to take good care of your carburetor, check your fuel lines, and look out for corroded gaskets. Propane is easy to store, has a very long shelf life, and is pretty much impossible to spill. Propane burns pretty clean as well meaning that you won’t have to clean your generator out as much. However, propane is less efficient than gas. You’ll use more of it. Plus, propane engines can be complex and hard to fix. Finally, if you’re expecting cold temperatures, consider that propane is pretty much useless in temperatures below 20ºF. Dual fuel generators are a great option as well. They let you use either fuel type, meaning that you’ll have a bit more room to improvise in a power loss situation. Two popular generator options are inverter and standard variants. They each have some great applications. For years, people have been using portable generators to keep their electricity going in all kinds of situations. However, only recently have inverter generators become popular. Let’s go over the differences between these two options. Inverter generators are smaller, lighter, and quieter than standard generators. They’re pretty innovative in that they are able to convert DC power into AC power with high frequency. This conversion process eliminates power fluctuations like the ones you see in standard generators. Both inverter and standard generators come in many different configurations with various power capabilities and fuel sources. An inverter generator is just a generator with a built-in inverter. When it comes to inverter generator vs standard generator operation, the real difference comes in with overall efficiency. Standard generators operate at a constant speed. While reliable, these speeds are also non-adjustable. They can cause unnecessary noise, fuel consumption, and exhaust output. Inverter variants are able to adjust their speeds according to the power requirements that are needed. Inverter equipped generators have innovative engines which vary their speeds depending on the load they’re under. This makes generators with inverters quieter, more fuel efficient, and more environmentally friendly. Inverter generators draw power from a DC source (e.g., a solar panel or a car battery), and converts the DC power into AC power using electronic circuitry. The converted electricity can be produced in different voltages and frequency, depending on the equipment to be used. Most inverter generator convert the 12V DC power from a DC source and convert it into the 120V AC power used by most appliances. Inverter Generators Vs generator – which one is better? First, let’s not think of the traditional old inverters because they cannot power appliances which can be powered by generators. Here we’re going to talk about two devices that can generate electricity well. So which is the best between the two? The difference depends on some factors, which includes the appliances to be powered, the number of appliances, and your budget. Let’s discuss some of the most important portable energy device factors and how each device stacks up for them. Many inverter generators are quite small for the amount of power they carry. Inverter generators are easy to store and transport, and for those who want some power for hiking or camping, inverter generators can easily fit in your car. In contrast, many generators are usually noisy, heavy and bulky, which requires them to to be mounted on frame and wheels. While they are also portable, they lack the convenience factors of being smaller, quieter and lighter. Generators are mostly designed to generate a certain amount of power needed to keep electrical appliances running. With generators, factors like the size of the unit have not been mainly considered. On the other hand, inverter generators are designed to be compact and lightweight since they don’t need big fuel tanks like generators. Although a limited fuel capacity means they have shorter run times, inverters have fuel efficient engines which adjust the power produced to match the load’s requirements. Inverter generators save up to 40% of the fuel and have run times of approximately 10 hours, which are just enough for most users. Inverter generators also help to reduce exhaust emissions. According to GreenGear global, the main difference between inverter generator and a conventional generator is the noise levels. Generators are usually very noisy and run at constant speeds of typically 3600 rpm to produce electricity. The engine speed should remain constant to generate electricity. On the other hand, inverters can adjust the amount of power produced using microprocessors. This means that the device can regulate its power output depending on the load applied making it quieter than generators. Since a generator is only an engine running at full speed to produce the desired frequency regardless of the load on it, the engine throttles up to keep the amount of generated electricity the same. The alternator’s output is directly connected to the load without processing. With inverter generators, AC electricity is produced by converting direct current into alternating current. DC capacitors smooth out the current produced to a certain degree before it gets converted into alternating current and the desired voltage and frequency. Inverters produce consistent and reliable power which does not rely on the engine speed. The power generated by inverter generator is much “cleaner” than the power produced by conventional generators. This power is almost of the same quality as the electricity typically supplied by your electric company. What’s the importance of using a cleaner power source? Well, today most products including your Televisions, mobile phones, and computers have microprocessors that are very sensitive to the quality of electricity used. If these devices use a power source that’s not clean, they may end up malfunctioning, or they might even get damaged. Which is why I personally have, and truly trust, a solar generator. Any application that requires sensitive electricity (most devices do) will benefit from the cleaner power produced by inverters. 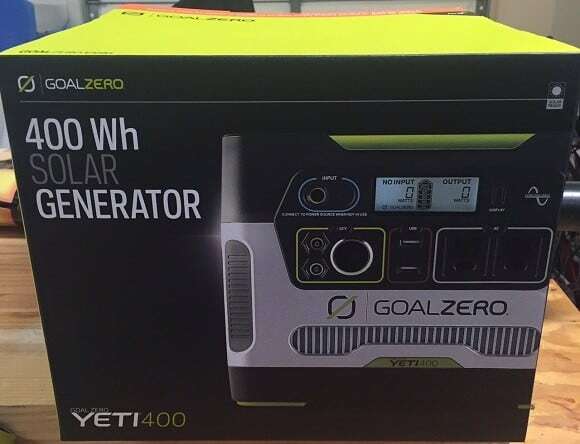 I personally have and use a Goal Zero Yeti, but it has a finite amount of power stored. There are fewer advantages when it comes to generators unless you need a very high power output. Conventional generators are also cheap and less costly to repair. Its simple design and functionality make the spare parts easily available at fair prices. Although inverter generators are more compact, quieter, convenient and fuel efficient with controlled power outputs, they are available at higher prices. But it’s up to you to evaluate how much you need each factor and how much you have budgeted for the device. Most inverter generators can be paired with identical units to double the powers capacity. With parallel capability, you can use smaller inverters to produce the same amount of power produced by one large generator. Conventional generators do not have this feature. Conventional generators need special cables to connect them to their output, and they cannot be paired with identical units. Inverter Generators vs Conventional Generator, which is the best? It’s up to you to weigh the pros and cons of each of the devices. If all you need is some power where there isn’t any, and your more concerned about the budget the quality, a conventional generator will work for you. But most people have realized that convenience, quiet operation, clean power, and portability is exactly what they need. Inverters make generators significantly more efficient. These generators are able to automatically adjust their engine speeds to match the needs to the application they’re being used for. They only produce enough power to run the electrical devices or appliances placing a load on them. This means that they will ultimately conserve fuel better. Inverters automatically make a generator more technologically advanced. They produce power similar to the power that’s used in a home or residential area. They can also be paired with identical units for more power output. So, instead of using a large and bulky standard generator that makes a lot of noise, you could use two inverter equipped generators and get the same power output with twice the efficiency. Generators with inverters are easier to take care of than non-inverter variants. You won’t have to use as much fuel, meaning less residue, and longer continuous running time. You’ll have to inspect your battery once a year, but that’s about it. With an inverter equipped generator, you’re not going to have to replace your carburetor, fuel lines, or gaskets as regularly. Plus, they use less oil. They make generators run better and for longer. Plus, inverter equipped generators are generally a lot lighter, quieter, more efficient, and easier to store. That being said, if you need high-output power and don’t want to mess with anything overly complicated, standard generators work just fine. 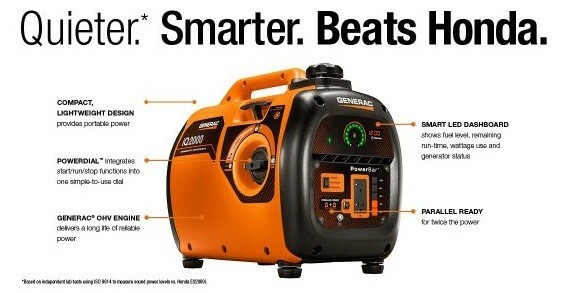 If you’re going to go with a standard generator, I’d opt for a powerful and reliable dual-fuel unit. No matter which generator configuration you ultimately choose, remember to consider your surrounding circumstances. Know where you’ll be using it, how much power you’re going to need, and if you will be able to maintain and clean your generator while off-grid.